The New Haven Register Blogs: Ramblings from The Runway: Pregame: New season, how 'bout some new traditions? Pregame: New season, how 'bout some new traditions? We're about 90 minutes from kickoff here at the Runway. Both teams are out on the field warming up, and it (the turf) looks terrific. That's a first. The past few years the grass on the field has either been dead (thank you, Rolling Stones) or coming up in chunks. Traffic seemed smooth on the ride in to the stadium, though I got here before 5. Let me know how your parking/tailgating experience went. Andre Dixon isn't playing tonight. Number of people surprised: zero. Since I don't have anything else to add (well, I could complain about the lack of good coffee here in the press box, but who'd listen?) here are my top 8 suggestions to spice up the game day atmosphere here at the ol' Runway. 1. A team of Husky dogs pulling a sled to lead UConn onto the field. You'd be able to join the great entrances in college football like the Ramblin' Wreck Car at Georgia Tech, the Florida State Seminole throwing the flaming spear and the Colorado Buffalo, to name a few. 2. If a team of Husky dogs isn't possible logistically, then dress someone up as the opposing team's mascot, put a couple of raw steaks in his pockets and let a hungry dog chase him across the field. What better way to whip the home crowd into a frenzy than witnessing a Husky tackle the enemy mascot at midfield and start tearing into his costume? PETA is planning a petition to have me lynched just reading that last suggestion. 4. Play random songs off my iPod for the 90 minutes before game time rather than the canned stuff they play now. 5. Organize a national anthem fly-by with one of the state's aircraft manufacturers. 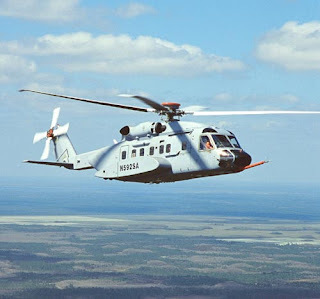 How cool would it be to see a Sikorsky SuperHawk attack chopper buzz the press box tower as the band plays "And the home, of the...bravvvvvve"
What, this wouldn't be sick? 6. Eighty-six the guy with the microphone yelling at everyone at midfield. 7. Quit playing Thursday night games. (Actually, this is probably going to happen). Play more Saturday afternoon games. (This probably won't happen. Thanks, ESPN). 8. Desi Cullen. Miked up. Play highlights at halftime. Cody Brown would work, too. I'd have done a top 10, but I'm out of ideas and we're close to game time. Any other ideas? Feel free to post 'em. Me and my tailgating crew dance to Rick Astley's Never Gonna Give You Up before every home game. No idea how it started (I think alcohol was involved) but they are 8-0 since we started doing it at the Rent. We have a big group now of believers. Look out for the 20somethings in Rick Astley UConn shirts. I'm serious. Is there video of this? If there isn't, there should be. The shirts are new this year. There are pictures but no moving pictures. We know a guy on the inside who is trying to get Rick Astley played in the stadium for the UVA game. If it happens, section 231 might explode.